Cocktails Under the Wishing Tree were made memorable and refreshing with this room design by Stemz Event and Floral Design, featuring furniture from Contemporary Furniture Rentals. Cynthia Martyn and Plate Occasions brought a unique installation of vintage porcelain blue and white plates, creating a show-stopping skirt and sea of magnificence. Little birds adorn the tops of the desserts, playing off of the red eggs to mark a new birth in the Chinese culture. Truffle Cakes and Pastry outdid herself with a gorgeous spread of cakes and desserts for a 100th day baby celebration. Cake Opera's trio of cakes inspired by red lacquer tables and a cake with colours and chinoiserie patterns inspired by this year's magazine cover. The St. Royals blew the audience's minds and hearts with their outstanding performance throughout the day. Wushu Project delight the crowd during the media hour. The Wedding Canopy — a new concept for the Chinese wedding to own its own identity, was designed by Melissa Samborski of One Fine Day Events and Pink Twig. Featuring a beautiful floor design by Ferris Wheel Press and printed by Event Graffiti. Chairs from Contemporary Furniture Rentals. 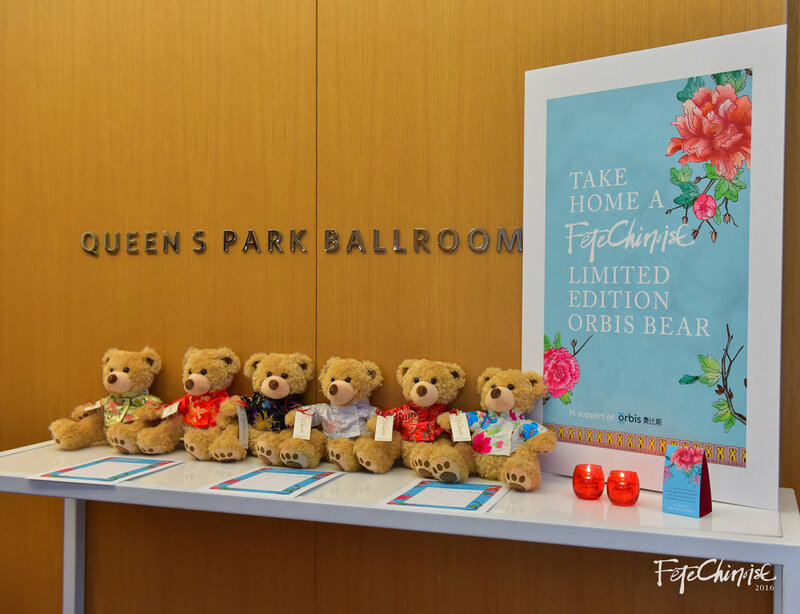 The Orbis Bear that accompanies children to go into surgeries, all dressed for Fete Chinoise by El Cachorro Couture. The highest bidders took home a bear to support the wonderful work of the doctors and team at Orbis Flying Eye Hospital. 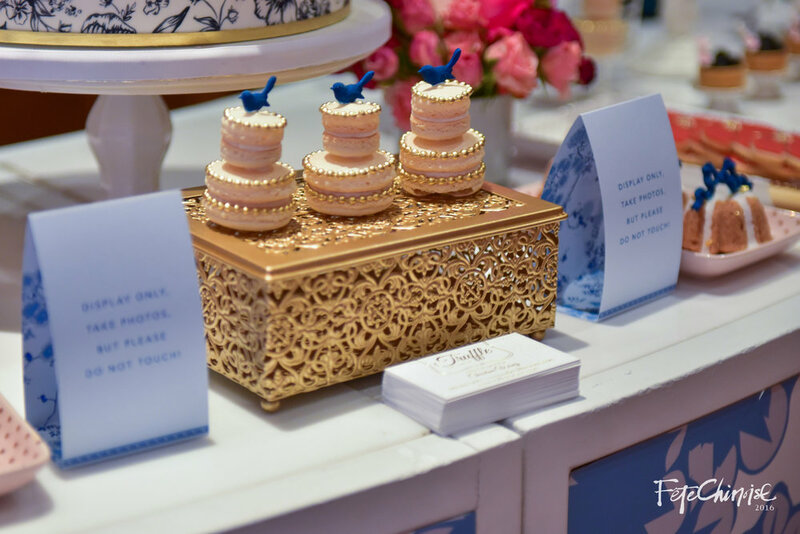 A modern take on the traditional tea ceremony, this vignette features the custom china at Shangri-La Hotel on a wooden tea tray, with beautiful lucky money pockets by PALETTERA. The Winter Solstice Dinner Party, designed by Fiori Floral and Spectacular Spectacular, featuring stationery and Chinese calligraphy by PALETTERA. Candles on table top with gold fish topper by Eddie Leung. The Modern Birthday, designed by Marta Urbanowicz of Artam Design Inc. and Kim Miyama Events. This room created an intimate setting with the sense of longevity, symbolism, and cultural cues. 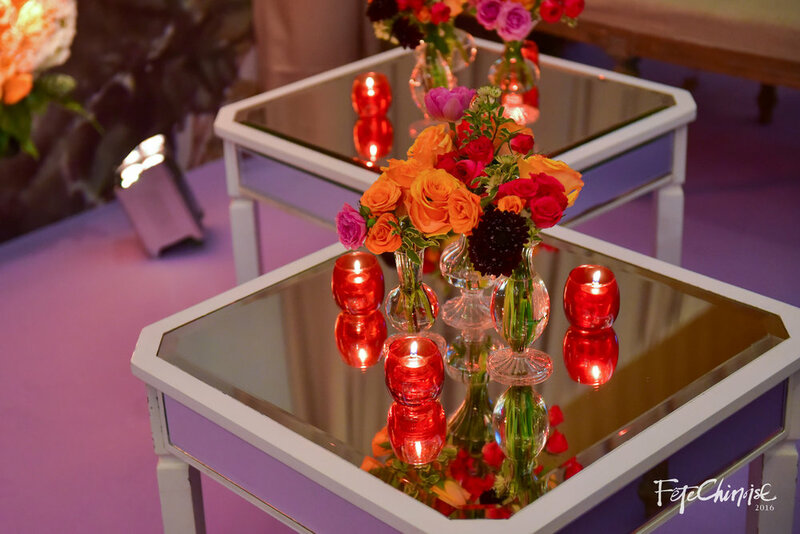 Beautiful highlights in front of the Great Wall of Flowers by Jackie O Events & Contemporary Furniture Rentals. Featuring carpet in purple by Reznick Carpets.